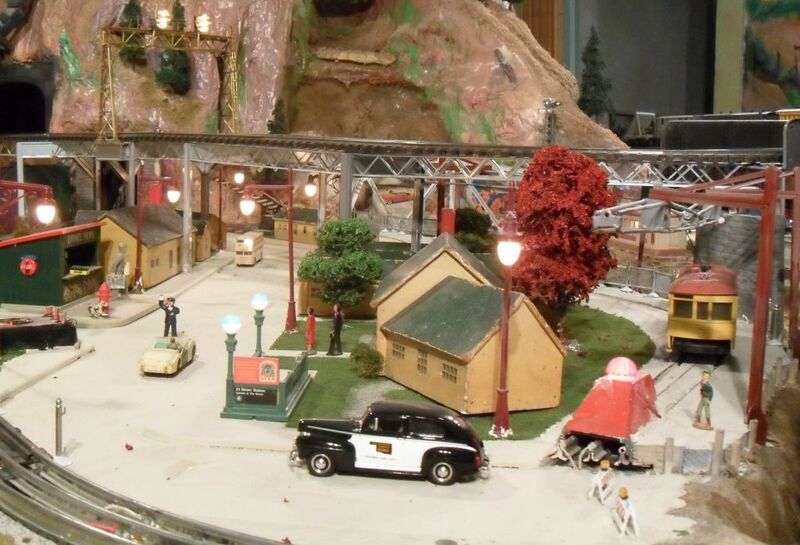 The only part of the layout that's pretty much finished. The cars were my step-dad's as a kid. I added the engine -- one of my first (of WAY too many) eBay finds. 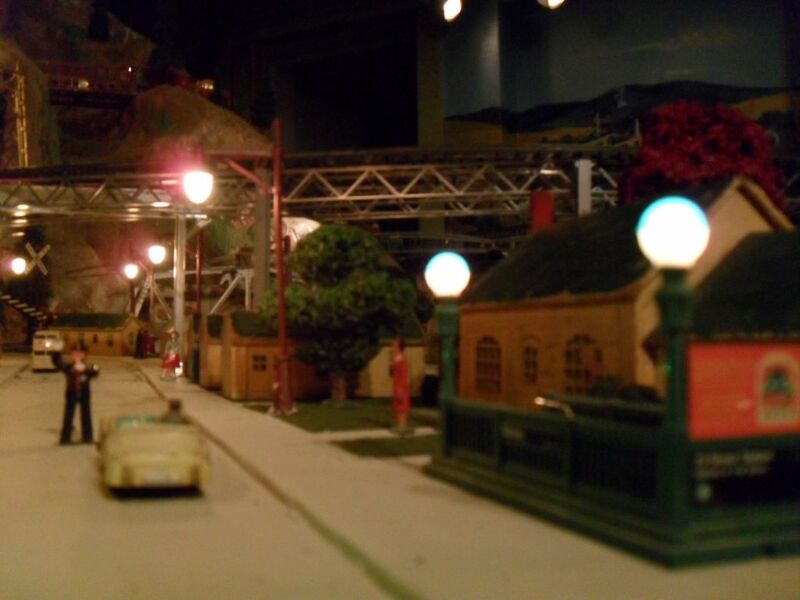 When I started all this, I didn't know Super-O existed -- so I did the whole layout out of my old O-27 track. Then I found some of my rolling stock just wouldn't make it through the old switches -- so I ripped them all up and replaced them with new O-27 switches. Then I bought the Class J Northern... I almost cried.The arrival 2353 warbonnet and Santa Fe Red Stripe set pretty much settled things. Everything got ripped up and replaced with vintage O-31 except for a couple of new O-31 turnouts. Yet another mistake... Soon the modern turnouts were replaced with vintage 022's. Live and learn, right? Then I learned about Super O. Well, I wasn't up for ripping everything up yet again -- but I did have a bunch of new (old) stuff I didn't have a place for on the layout... 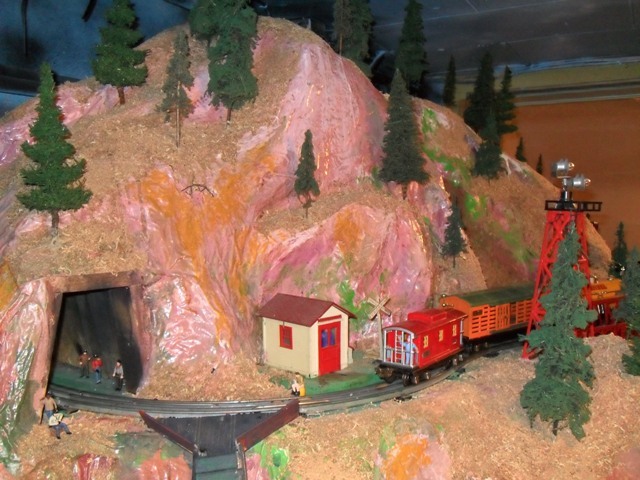 So I carved a couple of more tunnel portals in the mountain, and scratch-built a double-line El out of Plastruct girders. Glue, small plastic things and patience not being my strong suits, I nearly put a brick through it many times -- and it's not perfect -- but I was still pretty proud of it when it was finished. And I got some Super O on the layout! OK, I fnally got around to getting the grass and trees and... well all that stuff started. The town is pretty much finished now. That's at least a tenth of the layout <g>. and "The City at Night"
And in the "took WAY too much time for stuff nobody will ever notice" department... The seawall holding back the esplanade in which the trolley track is imbedded -- overlooking the rapids. OK. I'm obsessive. The Lionel/Ives transition set headed by a 238E is one of my special favorites. The green passenger set headed by the 1666 was my mother's when she was a kid -- and when it was passed along to me was one of the few engines I could count on to always run. The C & O 624 was always my 'go-to' engine as a youngster. No matter how bad my track work, how corroded the rails, how much voltage drop, it would faithfully make it around its designated loop. I'm an old softie, but I have a great affection for these two. I have a bunch of stuff now that's more rare, more pricey, more impressive and in better shape. But these guys will always have their special spot on my layout -- hey, they survived my childhood, and always came through -- they deserve it. The Flying Yankee was the first really cool thing I bought as an adult. When it arrived, and I unpacked it... Well, yes, once again my eyes lit up like a 154 Crossing Signal and I was 12 years old again. It's SO cool! My second big eBay purchase -- one car at a time -- was this Santa Fe Red Stripe set. It was the sort of thing my family couldn't hope to afford when I was a kid. Hell, who am I kidding, I couldn't afford it as an adult. 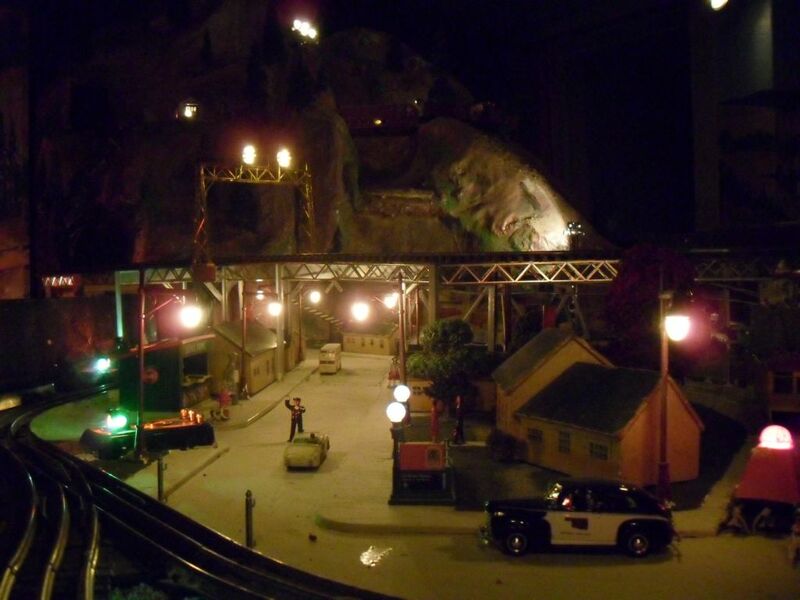 But I actually rode the "El Capitan" and the "Super Chief." So I kinda had to have it. Pretty special to me are the few buildings that have been passed down to me from earlier generations. My grandfather worked in highway safety his whole adult life. Early on, part of his job was showing traffic-safety displays to schools and community groups. 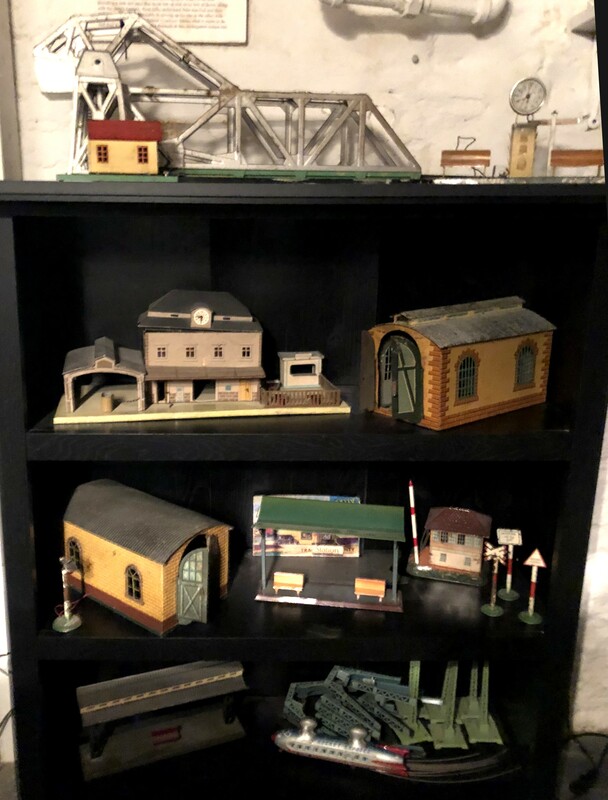 These wooden buildings were made by a Mr. Brumbaugh, an employee of Gramps just before WWII for one of these displays -- handily enough, at 1:48. 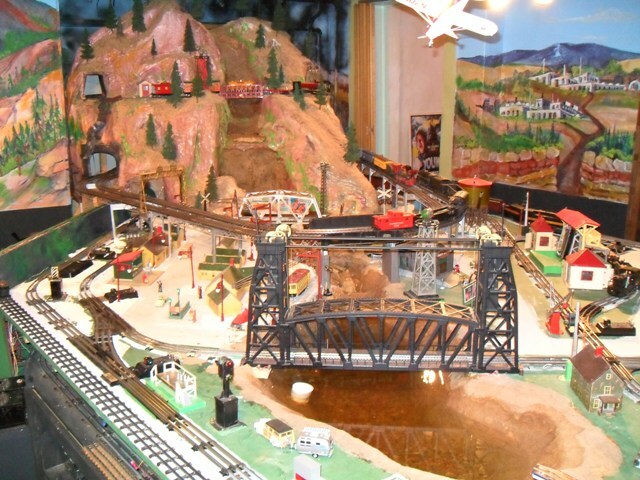 My cousin Bert, nicknamed "Butch," (well, my first cousin once removed -- I had to look that up) had his own layout. 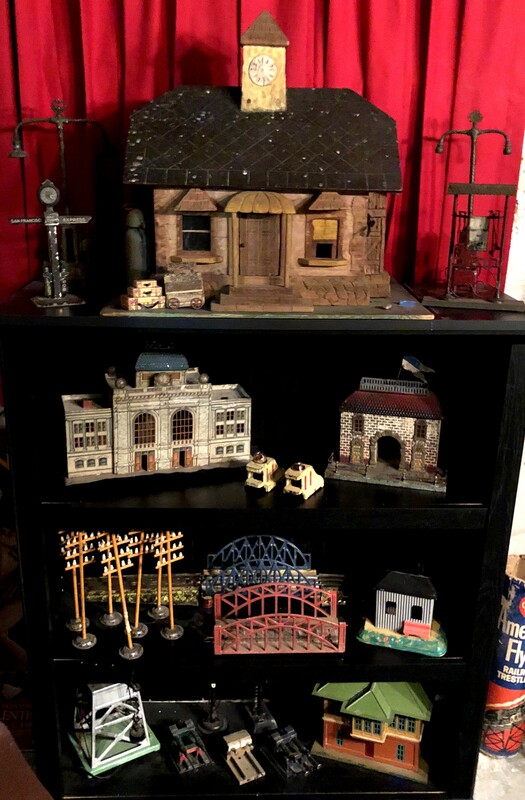 With the 'real' items not to be had, a family friend -- and auspiciously, tinsmith -- Alvin Vaughn, made him these cool tin buildings about 1944. I'm incredibly lucky these 'Butchville' buildings survived and made their way down the line to me. My long-suffering and VERY patient best-friend Bob (see the opening page) owns and flies a Tripacer. It would be impossible to REALLY acknowledge all the work he's put in on this insanity. But to do so in a tiny way, a Tripacer buzzes the layout. I found an unopened model from the 1960's, instructions actually yellowed. But with my (very) limited modeling skills, I managed to get it glued together, painted and even got the old decals almost straight. I love using old stuff. Accessories are all powered by these two ancient T's. 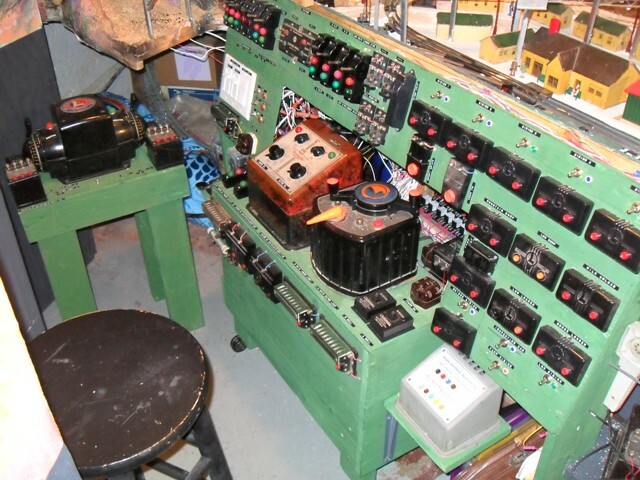 And behind that tidy control panel? Who knew things would get this out of hand??? 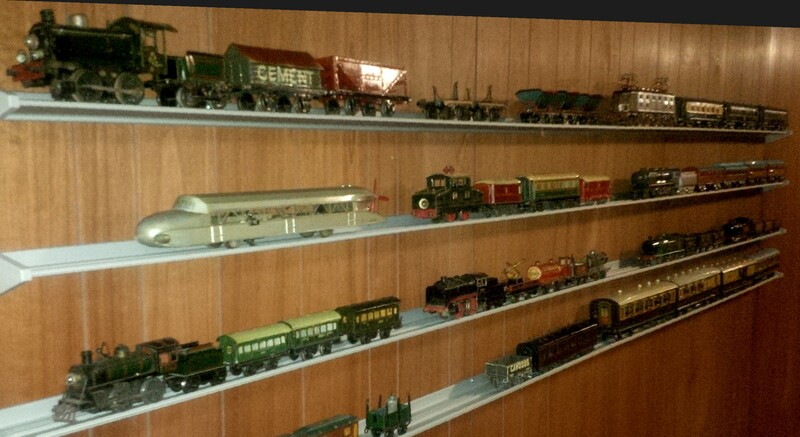 OK, I'm strange -- but the pride of my collection isn't even on the layout -- or a train for that matter. It's the test unit below. I got it (for too much money) from a former Lionel employee -- and it's pretty cherry (big smile). And I use it every day I'm working on the trains. See? Beautiful AND functional! I've always enjoyed monkeying around with mechanical and electrical stuff. So it kind of floats my boat. I use the Lionel rivet press all the time too -- or at least that's what I tell myself to justify buying it (smile). Oh... my grandmother built the workbench and it's her vice still attached. And just below? Granny's ancient Coca-Cola bottle opener. She drank a case of the 6oz bottles every day -- along with a pack of Camels. My kind of lady. Does On30 count as O??? 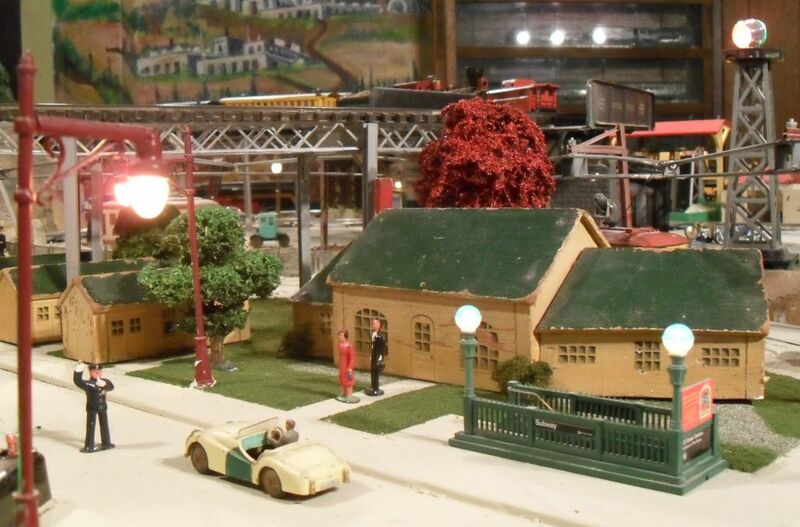 In any case, each Christmas this Bachmann Shea pulls jellybeans around a Mica putz-house village that spent many a Christmas on my Grandparent's mantle. The centerpiece is a rather sorry foil tree that's been with me every Christmas of my life. Atop it is a worn, fragile, fabric angel with feather dress and torn gauze wings. As a child, I thought she was about the most beautiful thing I'd ever seen. So she retains her place of honor on my Charlie Brown foil tree. 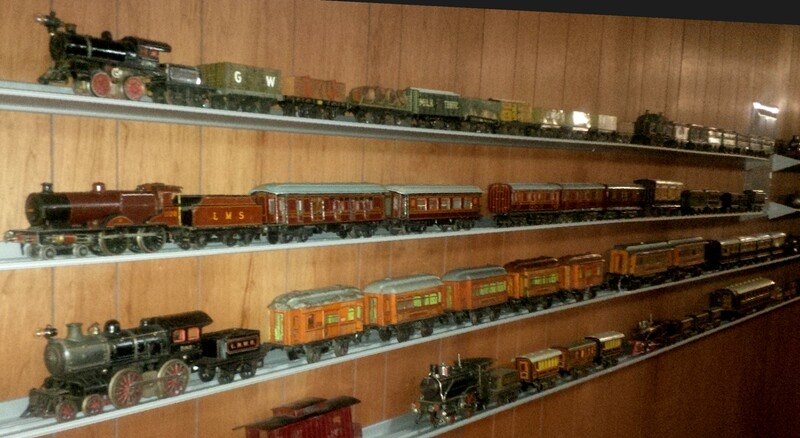 I have another wall of wooden shelves of pretty ordinary Lionel extras -- but more interesting stuff is in this corner. I just LOVE the vintage scale stuff. There's some Walthers, All Nation & Scale Craft there. And an item or two that appear to be scratch-built. Alas, they won't begin to run on my O-31 tubular, so await a BIG space with maybe some hand-spiked track... (I already have ties and spikes...) For close-ups of some, check out my "Treasures Without Track" page. This once was the pool table room. Well... 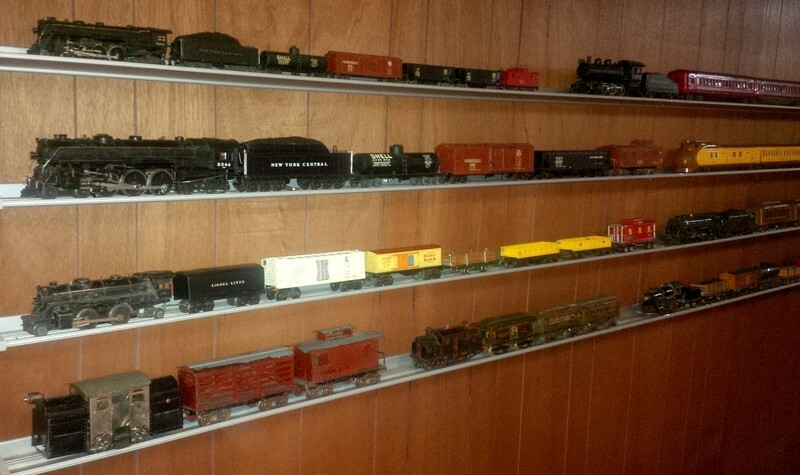 The pool table is still there, but I call it "Collection Creep..." Trains have now engulfed all four walls. On the long wall is my Marx and AF (With a couple of Pre-WWI treasures in the barn doors). The plan is for a Marx/AF Layout on an electric winch that lowers from the ceiling over the pool table. 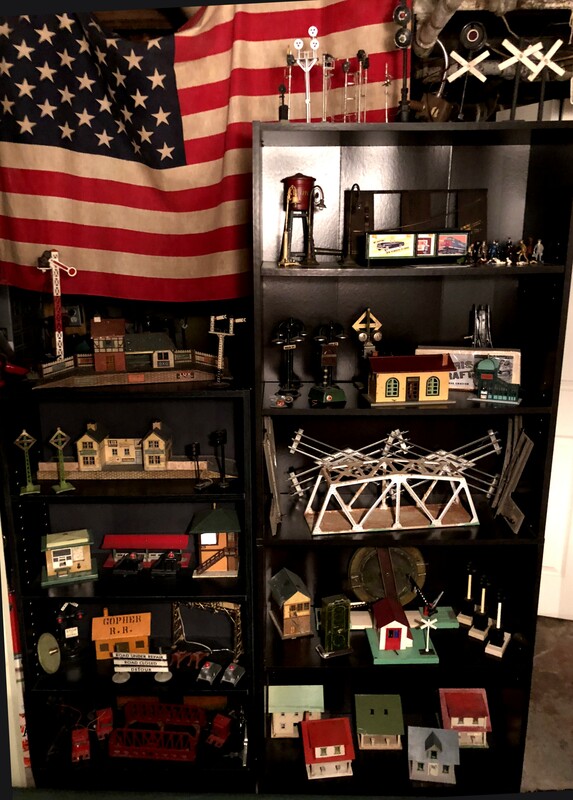 (Yes, I'm serious -- I saw the mechanics at another collector's house and it was kind of awesome...) On the bottom shelf is the Kansas City Southern construct in honor of my great grandfather. He worked for the KCS his whole adult life. And on the other walls, shelves of fun stuff I've aquired in the hope I can find space for it on some layout or other. 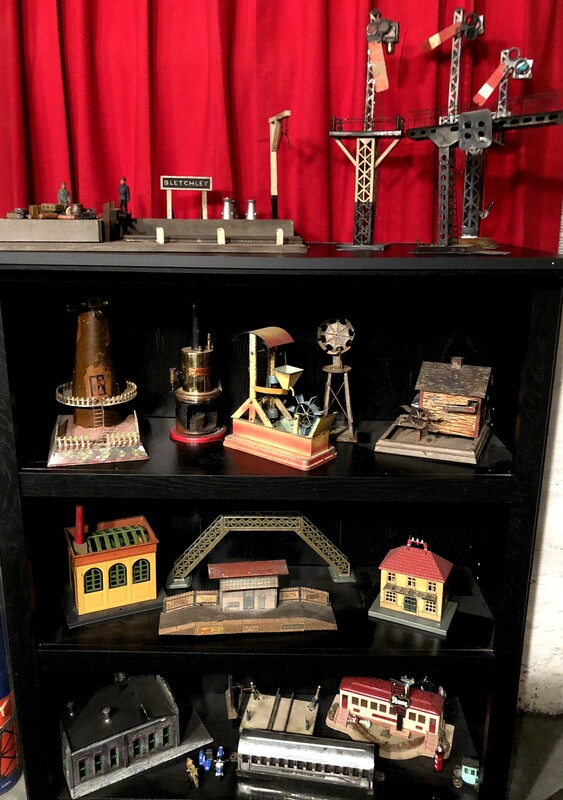 Some Lionel, much old European -- and of course, my steam toys. In a separate building we have two antique bowling lanes my mother rescued from a Knights of Columbus hall that was being demolished. The Standard Guage layout now resides above one. And on the walls... Items destined for the prewar O and Gauge-1 Layout for which I've just started track work.